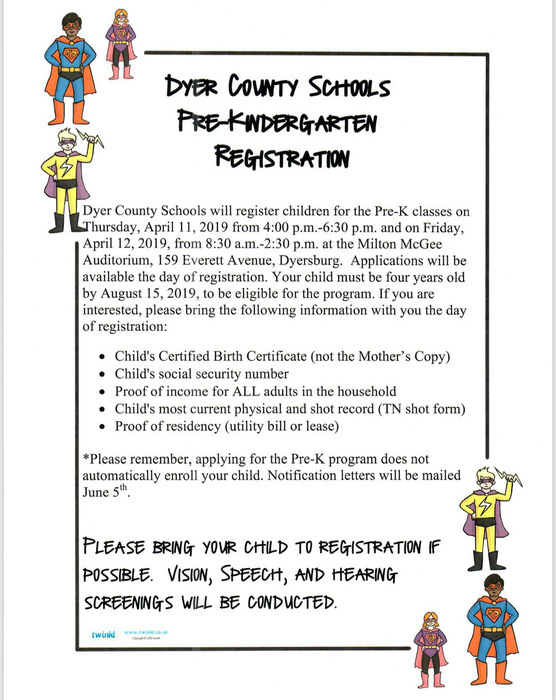 Dyer County Schools will register children for the Pre-K classes on Thursday, April 11, 2019 from 4:00 p.m. - 6:30 p.m. and on Friday, April 12, 2019, from 8:30 a.m. - 2:30 p.m. at the Milton McGee Auditorium, 159 Everett Ave, Dyersburg. Applications will be available the day of registration. Your child must be four years old by August 15, 2019, to be eligible for the program. 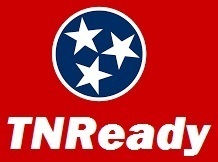 If you are interested, please bring the following information with you the day of registration: Child's Certified Birth Certificate (not the Mother's Copy) Child's social security number Proof of income for ALL adults in the household Child's most current physical and shot record (TN shot form) Proof of residency (utility bill or lease) *Please remember, applying for the Pre-K program does not automatically enroll your child. Notification letters will be mailed June 5th. Please bring your child to registration if possible. Vision, speech and hearing screenings will be conducted. Kindergarten Registration will take place on Wednesday, April 10th from 8:15-3:30 at each elementary school. A child must be 5 years old on or before August 15, 2019 to attend Kindergarten during the 2019-2020 school year. Parents may pick up registration packets at their child's school. Included in this packet will be: (1) an explanation of requirements for enrollment (2) and a registration form. State law requires that all children have a physical examination and proof of immunizations before entering school. You may register your child without the immunization record and physical, but you must have them both before school starts August 1, 2019. On registration day parents need to bring the following: child's birth certificate, the child's social security number and the Certificate of Immunizations form (if you have physical and immunization record already completed). The Dyer County High School home soccer game versus Martin Westview for today, Thursday, March 14 has been cancelled and rescheduled for Tuesday, April 23 at 5:30. The Dyer County High School tennis match at Brighton High School has been cancelled for today, Thursday, March 14. The Dyer County School System will be closed on March 18-22 for Spring Break. Enjoy your break but please take a moment to read the attached statement. Let's finish the year strong! 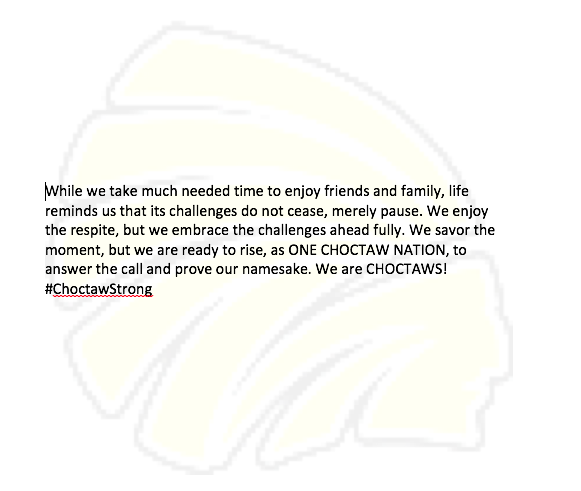 Go Choctaws! 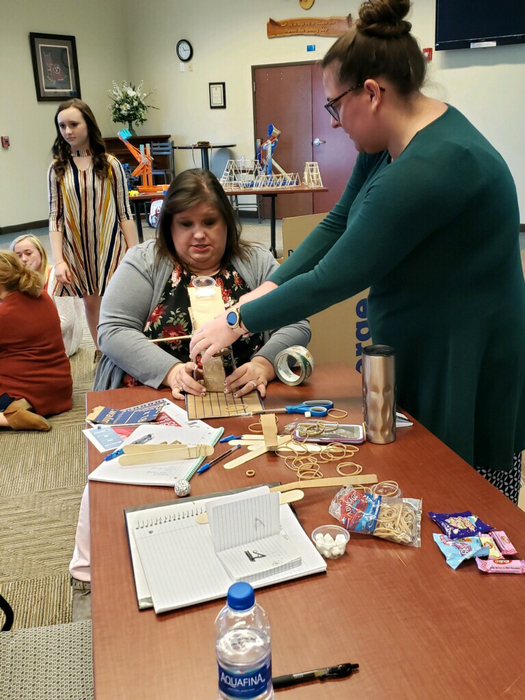 Students from the STEM program at Northview Middle School worked with our elementary teachers today at the STEM workshop at DSCC. 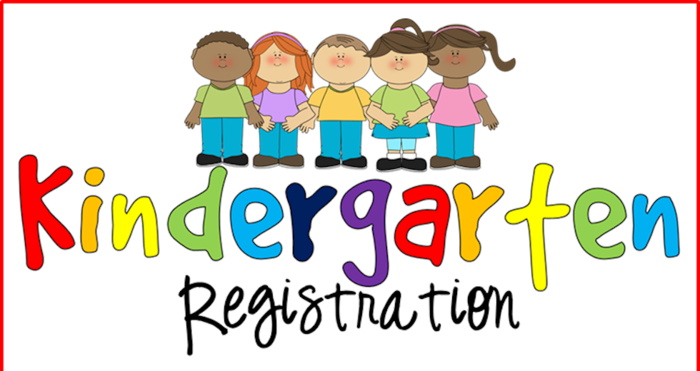 Kindergarten Registration will take place on Wednesday, April 10th from 8:15-3:30 at each elementary school. A child must be 5 years old on or before August 15, 2019 to attend Kindergarten during the 2019-2020 school year. Parents may pick up registration packets at their child's school. Included in this packet will be: (1) an explanation of requirements for enrollment (2) and a registration form. State law requires that all children have a physical examination and proof of immunizations before entering school. You may register your child without the immunization record and physical, but you must have them both before school starts August 1, 2019. On registration day parents need to bring the following: child's birth certificate, the child's social security number and the Certificate of Immunizations form(if you have physical and immunization record already completed). Congratulations to the Dyer County High School Lady Choctaws on their win over the Hardin County Lady Tigers in the Region 7-AAA Semifinals!!! The Lady Choctaws will advance to play Arlington in the Region 7-AAA Championship game on Wednesday, February 27th at Munford High School at 7:00 p.m.
Dyer County High School will host the first round of the 7AAA Regional Tournament. The Lady Choctaws will be in action on Friday, February 22 at 6:00 p.m. and the Choctaws will be in action on Saturday, February 23 at 7:00 p.m. The price of admission is $7.00. Only a TSSAA championship event card and a TACA card will be accepted for passes. Admittance is 1 person per card. Come out and support the Lady Choctaws and Choctaws! 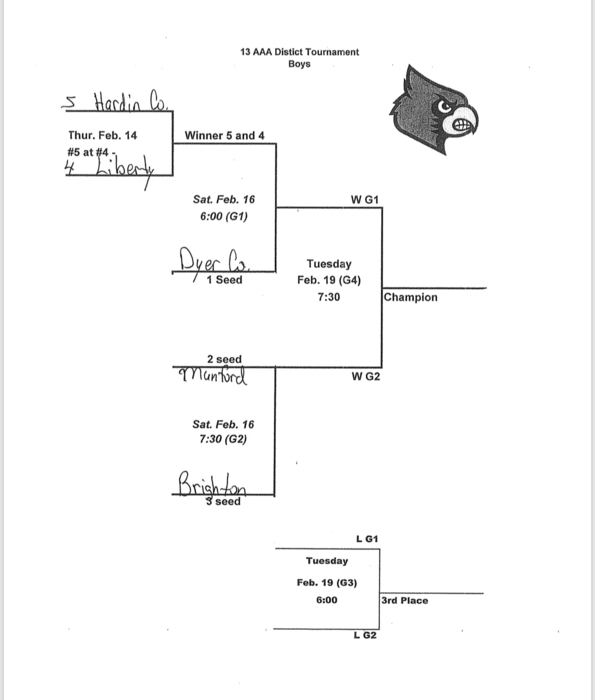 The District 13 AAA Tournament will be held at Brighton High School. 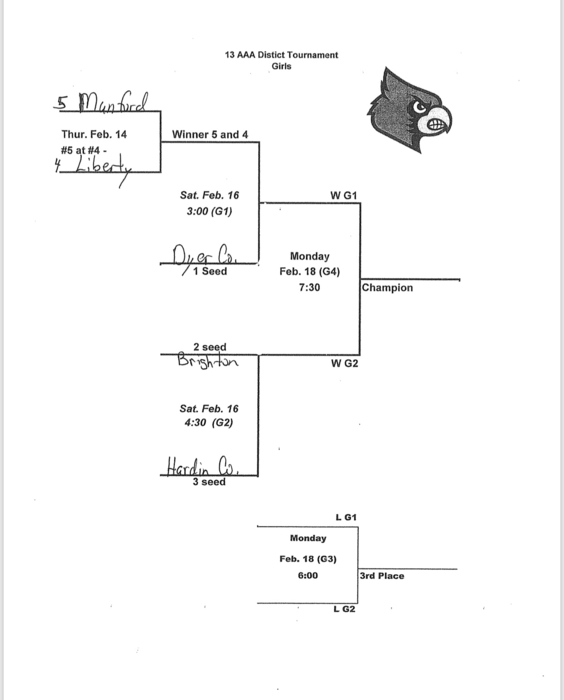 The Lady Choctaws will play this Saturday at 3:00 p.m. and the boys will play at 6:00 p.m. We hope to see you there. 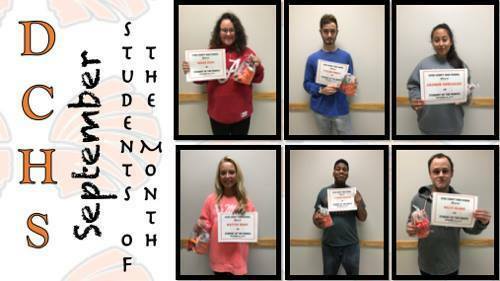 Dyer County High School’s Most Valuable Choctaw and nominees were acknowledged at today’s PACE meeting. 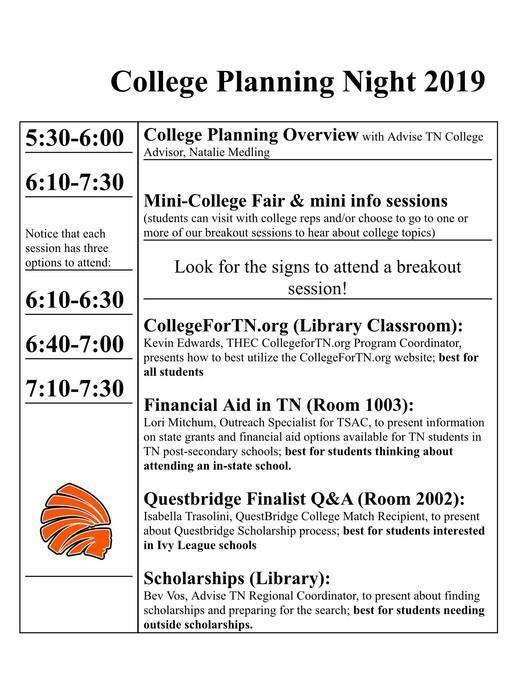 All juniors and their parents/guardians are invited to Dyer County High School for College Planning Night Thursday, February 21st from 5:30 p.m.-7:30 p.m. 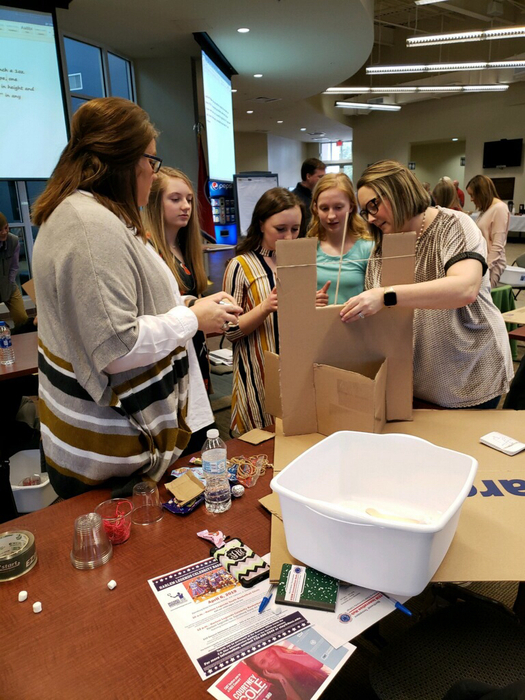 The event will help families learn about what steps they should consider taking over the next year to ensure a smooth college and financial aid application process. Please see the attached picture for a detailed schedule. Students at Finley Elementary School enjoyed the STEAM bus last week. Fourth grade students made balloon cars to demonstrate potential and kinetic energy. 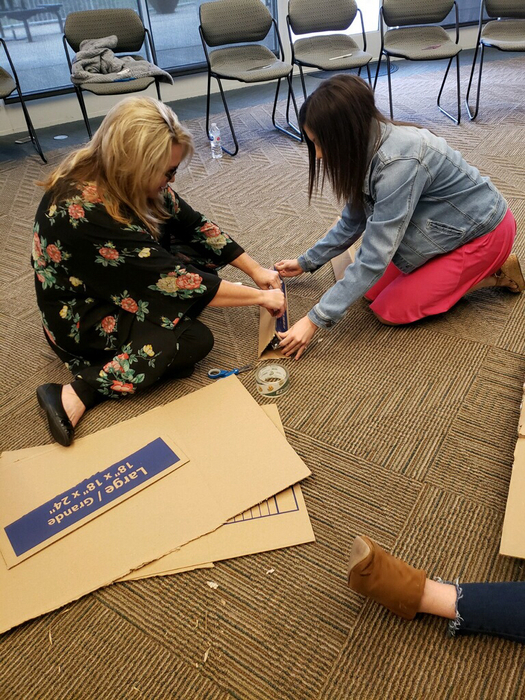 Fifth grade students made pasta cars to demonstrate forces and motion. Three Oaks Middle School is honored to have Officer William Whitson protecting the educational process. School staff took time today to let Officer Whitson know how much he was appreciated. 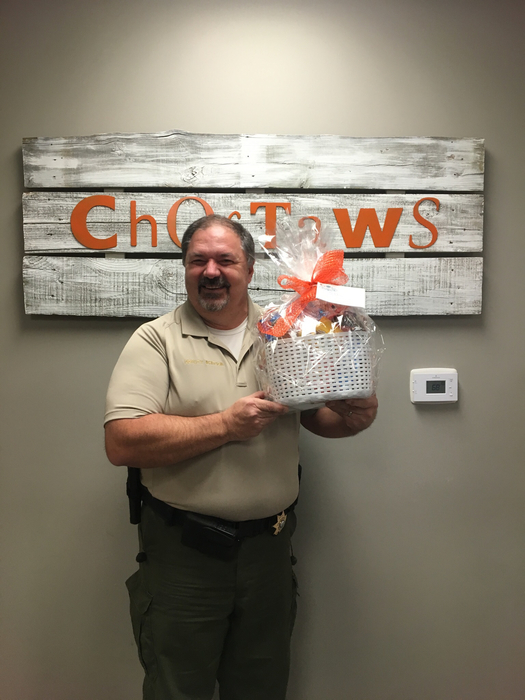 This week is Officer Appreciation Week and the staff at TOMS took this opportunity to celebrate with Officer Whitson. The Dyer County High School softball team is selling BBQ bologna. It will be ready for the Super Bowl. The pick up date is Saturday, February 2. Please contact Coach O'Bright or any softball player to order. Orders will be taken until January 25. 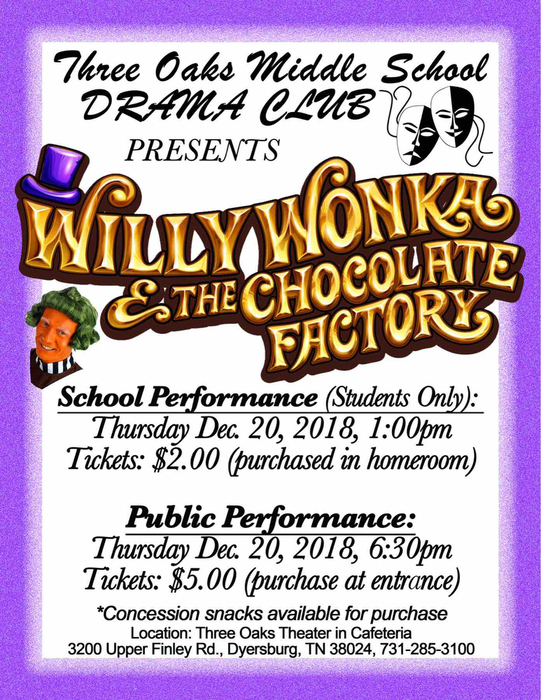 The Three Oaks Middle School Drama Club will present Willy Wonka and the Chocolate Factory on Thursday, December 20. The rescheduled ACT date for this past weekend’s cancelled test will be this Saturday, December 15th. This test will still count as a National ACT test since the original was cancelled for weather. If for some reason, your schedule does not allow for you to retake the test on that day, you can contact ACT to reschedule for a later date at no charge. 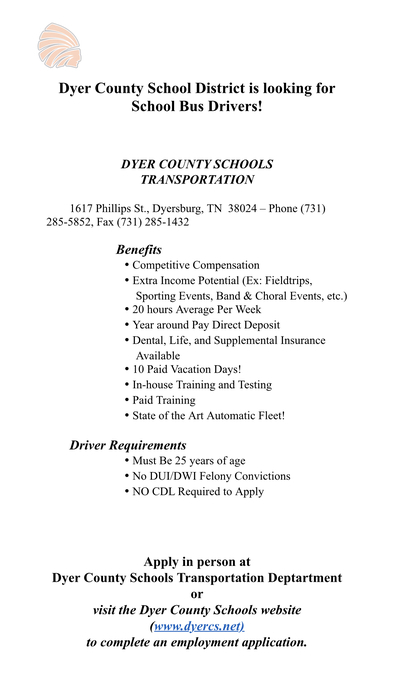 The Dyer County School System needs bus drivers. Please see the picture for more details. The basketball games with Wooddale High School on Friday, December 7 and Saturday, January 5 have been cancelled. 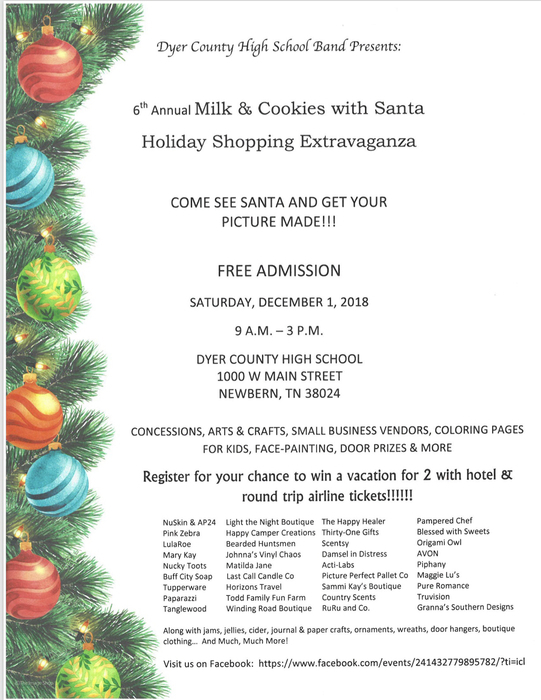 The Dyer County High School band is hosting Cookies with Santa on Saturday, December 1. Please see the attached picture for details. Dyer County and Dyersburg City Schools will return to regular session Friday, November 16, 2018. Due to the forecasted weather conditions, Dyer County and Dyersburg schools will be closing today at 1:00 p.m., Wednesday, November 14, 2018. The Dyer County System is still using TeamReach for District Notifications. The group code is DCANNOUNCE. Please go to http://www.dyercs.net/notifications--4 to find out more information and to learn how to install the app. The DCHS cafeteria is pleased to announce the addition of fresh hand-made pizzas and calzones to the lunch menu. 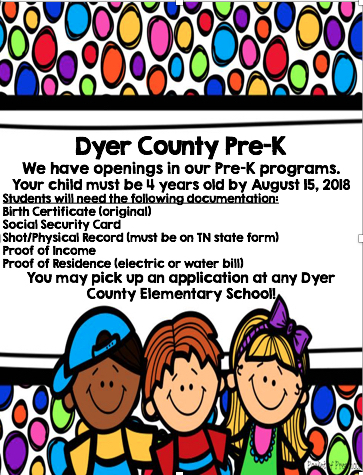 The Dyer County School System has openings in our prechool classrooms. If you are interested in your child attending one of our preschool classes, please complete an application. Applications are available at all elementary schools. All afternoon activities have been cancelled due to the possibility of inclement weather. 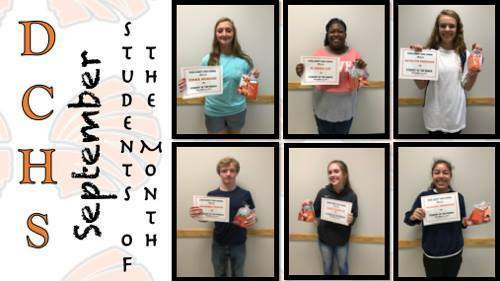 Congratulations to Dyer County High School's PBIS Students of the Month for September. 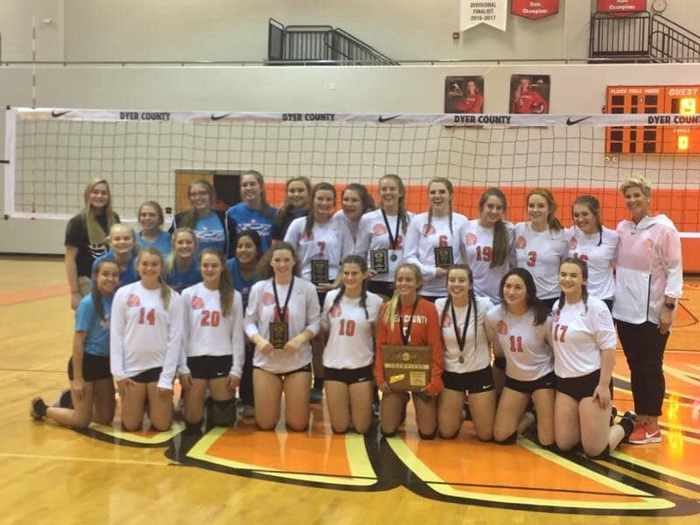 Congratulations to the Dyer County High School Lady Choctaws volleyball team for being the 13AAA District Tournament Champions. The Choctaws defeated Brighton in quarterfinals in four sets and swept Arlingtonin in three sets to take the championship. Regionals are set for Tuesday at DCHS. 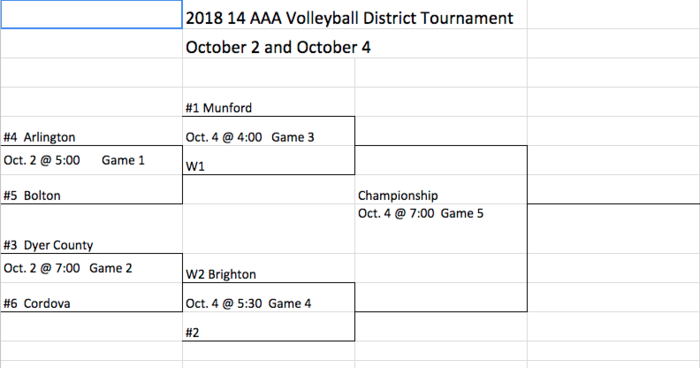 Dyer County High School will be hosting the 14 AAA District Volleyball Tournament on Tuesday, October 2 and Thursday, October 4. The price for admission will be $5.00. TSSAA and TACA passes will only be accepted. 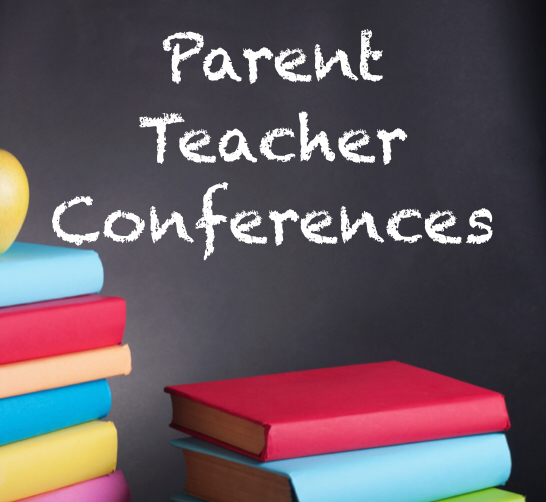 Parent teacher conferences will be held today from 3:30 p.m.-6:30 p.m. for all elementary and middle schools. Way to Grow!! Dyer County Schools received an overall composite of 5 in growth on last year's test scores. Level 5 is the highest score that a district can earn. CONGRATULATIONS TO OUR STUDENTS AND STAFF. 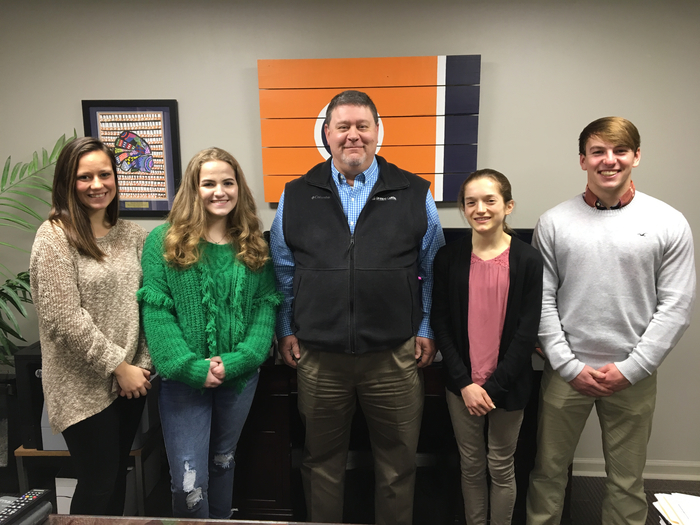 Attention parents of Dyer County High School students: Any parent/guardian that would like to be added to the daily email announcements and/or google classroom announcements please email Jennifer Ray @ jenniferray@dcchoctaws.net with the following information: Subject: Please add to daily announcements AND/OR please add to google classroom announcements In the email please list child’s name and grade level and parent/guardian name. 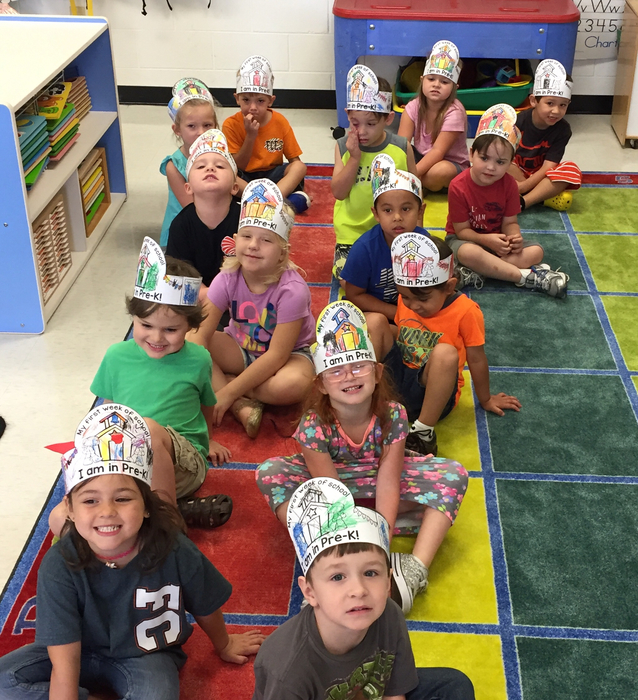 Fifth Consolidated Elementary’s preschool students rocked the first full week of school. 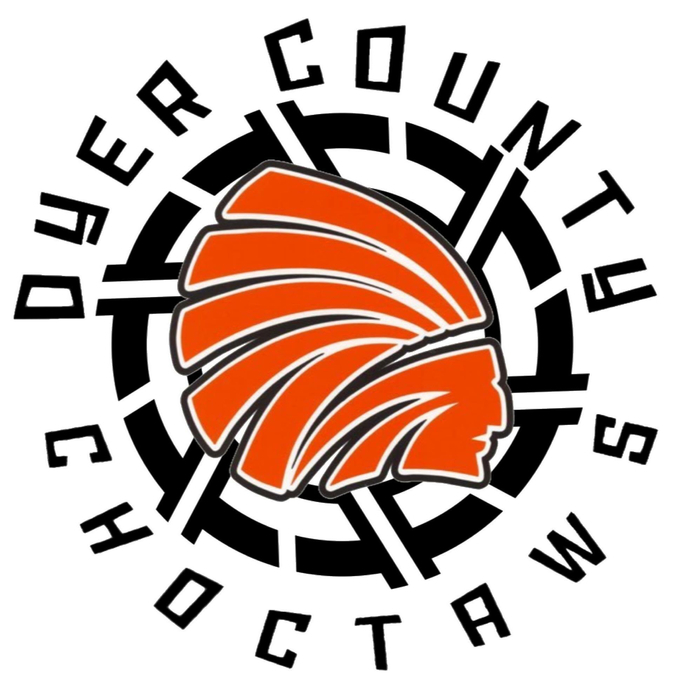 Due to possible weather conditions later in the night, the Dyer County High School football game at Crockett County High School will start at 6:00 p.m. instead of 7:00 p.m. The Dyer County School System is hosting a "Back to School Bash" on Thursday, July 26 at the football stadium at Dyer County High School. 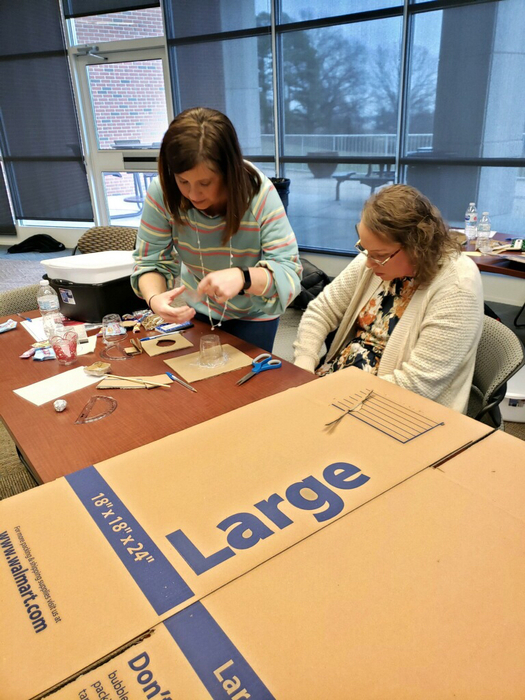 The event will be from 6:00 p.m.-7:30 p.m.
All elementary schools within the Dyer County School System will hold an early registration day on Tuesday, July 10 from 9:00 a.m. until 2:00 p.m. Registration will be held at each school. Dyer County Schools and Dyersburg City Schools will complete the 2017-2018 school year on Friday, May 25th. Students will dismiss and buses will run at 11:00 a.m. No lunch will be served on May 25th. 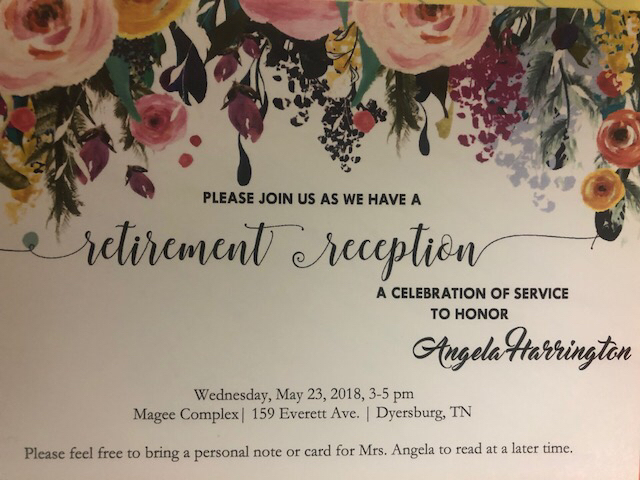 There will be a retirement reception honoring Angela Harrington on Wednesday, May 23 from 3:00 p.m. until 5:00 p.m. at the Magee Complex.